The ANCA Lunch Club meets on two days a week: currently on Monday and Tuesday at St Mildred's Centre (main or small Hall) on Bingham Road, Addiscombe. 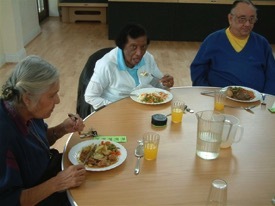 Around 20-25 people a week come and enjoy a reasonably priced hot meal and then may take part in arranged activities, such as raffles, Bingo, quizzes, crafts, etc. or just sit, chat and relax. ANCA provides a qualified, paid Supervisor to ensure the safe running of the Lunch Club. 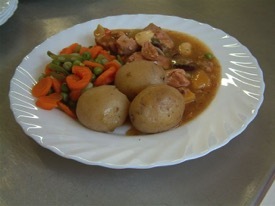 Hot meals are professionally prepared and brought in and served by our Lunch Club Supervisor and a volunteer team. ANCA can arrange for escorted Accessible transport to and from the Centre using Dial-A-Ride services or volunteer car drivers. All dietary requirements can be catered for. Please let us know any needs in advance. St Mildred’s Centre is fully accessible for wheelchair users. There is usually some social activity or entertainment after the meal. There is a limited capacity at each session, so please contact the ANCA office if you would like to join us or you know of someone who might benefit. Let us know any transport needs and dietary requirements.